I am proud to announce the launch of my own home made fertilizers and additives, all for 1/4 the price of all competitor products: please remember, all my nutes and additives are raw form powders. Vigorous mixing and dissolving in water by hand in a smaller container or blender before adding to reservoir or mister is optimal. Cannaminos – the most cannabis specific amino acids to be added to any recipe. Builds bigger plants, more nutrient uptake, aids immune system, bigger more resinous buds. Only med-man offers this product which is 100% organic, earth friendly and made exactly for our medicine. Cannabolic Stacker – steroids for cannabis. All natural. Bigger, faster growing plants with more resistance to disease and stress. Increase seed germination, clone success and rooting times, thicker stalks and leafs, bigger buds and yields, more resin and overall odor and will usually take at least 7 days of any of your preferred strains subject to facility. For use in all stages of plant life. 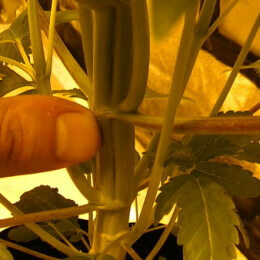 Directions – 0.1g liter foliar every even week until buds form. 0.1g gallon res feed every odd week from clone/seed soak to harvest. Kind Cal – pure powdered calcium supplement. Infused with iron, nitrogen and magnesium. For super green, lush plants with a strong immune system. Always remember, cannabis needs on average 4 times more calcium then phosphorus, especially in veg. Kind Bud – Bloom – the most cannabis specific bloom booster on the planet. Contains natural, organic and chemical salts. For the biggest most resinous buds of medicinal grade. Out yields big bud from advanced nutrients. Kind Bud – Swell -the most cannabis specific bud ripening stock on the planet. Contains natural, organic, and chemical additives for the best bud finish. Packs on girth, mass and resin in the last 2 weeks before flushing. Side by side tests prove kind bud swell beat out advanced nutrients “overdrive” and green planet wholesale “finisher”. Directions – 2 weeks to flush – 0.5 g / liter, 1 week to flush – use base nutrient at 1/2 strength. Add other half ppm with kind swell. Organic Sugar Coat – for the earth conscious grower. Superior to regular sugar coat, a sweeter smell and taste is achieved because it is organic (by amanda). You support farmers trying to make a difference as well. Kind Base – this is a one part fertilizer that has all you need from clone to harvest. The most cannabis specific formula available. Made for use with all my other additives and boosters. Contains 88 essential elements and minerals for peak performance in your plants. Medicinal Grade Marijuana Genetics (mgm genetics) – the only seeds grown by a breeder with ailment specific traits. By patients for patients.